Anna Farago, hand-pieced quilt, installation view, Handle With Care, 2018, Soul Craft Festival, Melbourne. Photo courtesy Soul Craft Festival. Pip Lincolne, pom-pom rug, installation view, Handle With Care, 2018, Soul Craft Festival, Melbourne. Photo courtesy Soul Craft Festival. Munaw Poe and Shuklay Tahpo, hand-woven tapestries, installation view, Handle With Care, 2018, Soul Craft Festival, Melbourne. Photo courtesy Soul Craft Festival. 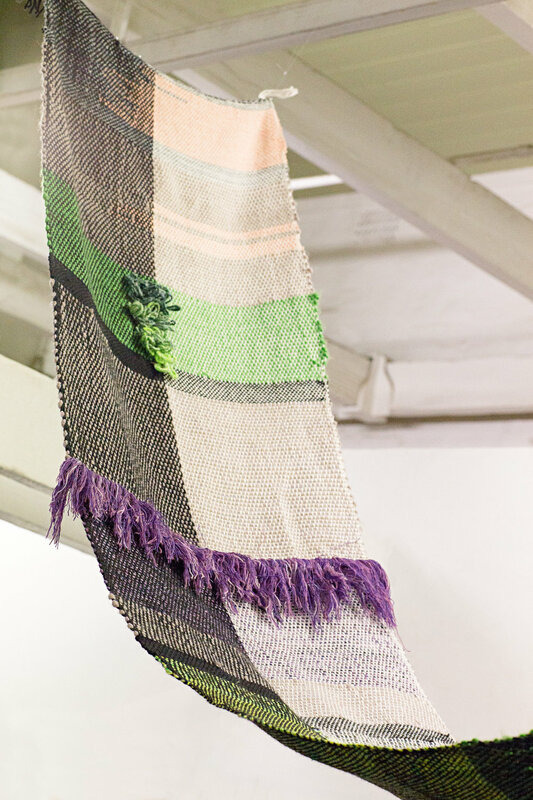 Beck Jobson and Ramona Barry, collaborative weaving, installation view, Handle With Care, 2018, Soul Craft Festival, Melbourne. Photo courtesy Soul Craft Festival. Robyn Rich, installation view, Handle With Care, 2018, Soul Craft Festival, Melbourne. Photo courtesy Soul Craft Festival. Hand-knitted garments, Installation view, Handle With Care, 2018, Soul Craft Festival, Melbourne. Photo courtesy Soul Craft Festival. Artists: Jane Badger, Kiyomi Burgin, Elizabeth Barnett, Ramona Barry & Beck Jobson, Aaron Billings, Roberta Cummings, Anna Farago, Tal Fitzpatrick, Zak Foster, Hannah Gartside, Jake Henzler, Ruby Hoppen, Kate James, Ani Lee, Holly Leonardson, Erin Lewis-Fitzgerald, Pip Lincolne, Adele Moon, Emma Peters, Munaw Poe, Robyn Rich, Gina Rockenwagner, Samorn Sanixay, Felicia Semple, Caitlin Shearer, Shuklay Tahpo, Marta Tortajada, Pauline Tran, Ilka White and Elizabeth Yong. Handle with Care was a group exhibition that invited makers from Melbourne and around the world to share a significant hand-made textile object from their past, as well as the story and meaning behind its creation. The exhibition was curated for the inaugural Soul Craft Festival that took place from 9 - 10 June at Meat Market, North Melbourne. Featuring a diverse representation of mediums and techniques including knitting, crochet, quilting, sewing, patchwork, spinning, mending, weaving and toy-making, the artists in Handle with Care demonstrated how making creates meaning through intention, materiality and form. The works in the exhibition ranged from everyday objects and personal artifacts to politically and conceptually motivated works. In all cases, the objects held a special meaning and significance for the maker – whether that be in the object itself or told through the process of its making. Handle with Care was an exhibition that celebrated making, and the varied and diverse roles that textiles play in our lives in uniquely personal ways.